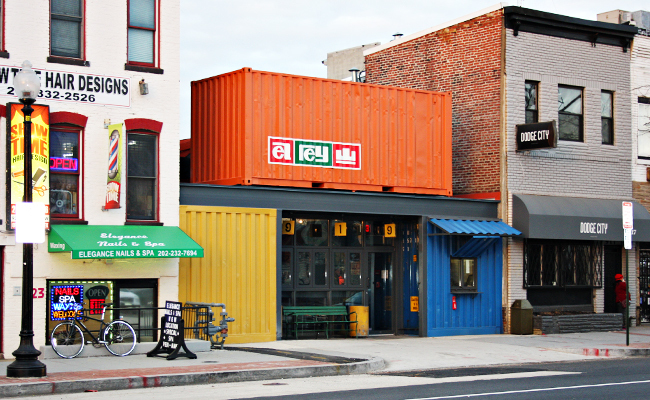 El Rey Mexican Beer Garden Opens on U Street 1/10/14 | Exploring Food & Drink in D.C.
El Rey Mexican Beer Garden - The District's "first Authentically Built Shipping Container Establishment". U Street, Washington, D.C. officially welcomed El Rey; a Mexican Beer Garden to the growing community on January, 10. 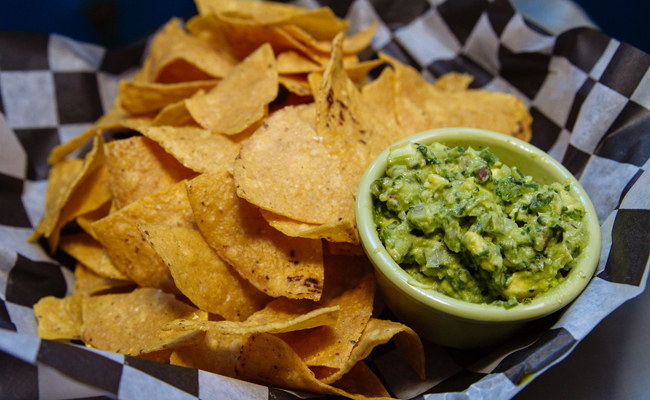 The newest restaurant venture by Ian and Eric Hilton, who also own American Ice Co., Satellite Room, and Brixton, offers affordable, authentic Mexican fare. 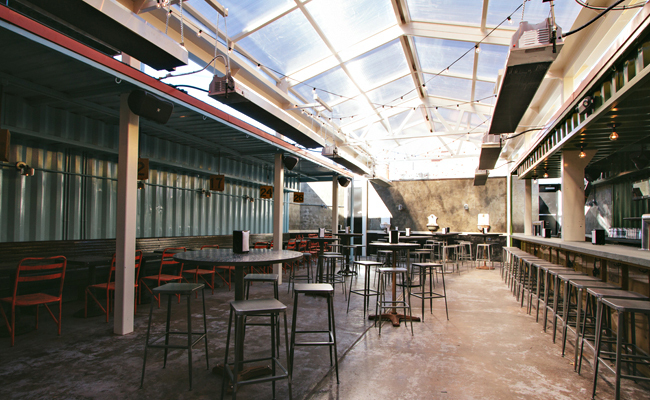 What makes El Rey particularly special is that nearly the entire structure is built from repurposed industrial shipping containers and other various recycled materials, making for a colorful and visually unique experience. In fact, when you walk out of the U Street metro station, you won’t be able miss the architectural oddity among the more traditional painted brick buildings. El Rey’s interior, while not particularly large, feels spacious once diners step into the heated, covered patio. Designed by Edit Design and Joe Reza, the high retractable ceiling brings in soft natural light due to its opaque plastic construction, and strings of lights illuminate the patio once the sun sets. The bar reaches nearly the entire length of the patio on the right, while additional tables and red chairs line the left. The mosaic tiled tables and stools in the center are spaced at comfortable distances allowing for easy access to all parts of the restaurant. In other words, getting to the restroom in between margaritas won’t leave you stuck in a labyrinth. 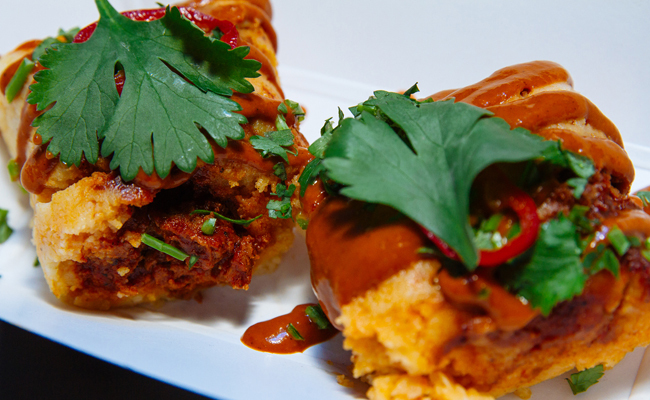 Executive Chef Jorge Pimentel has crafted a delicious Mexican menu with a price point everyone will appreciate. 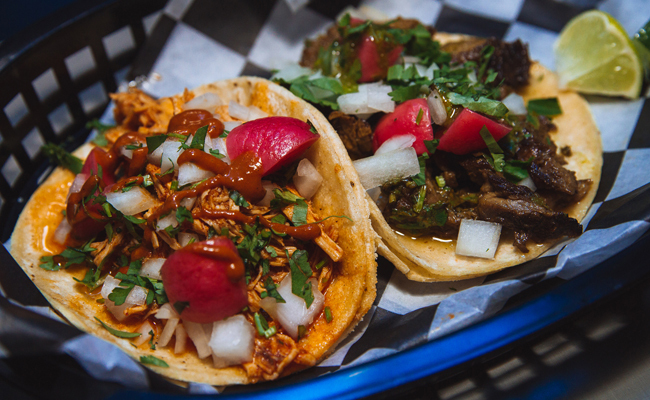 El Rey offers 8 staple varieties of tacos and one daily option all for $3-$4. While substitutions are “politely declined”, both corn (gluten free) and flour tortillas are available. 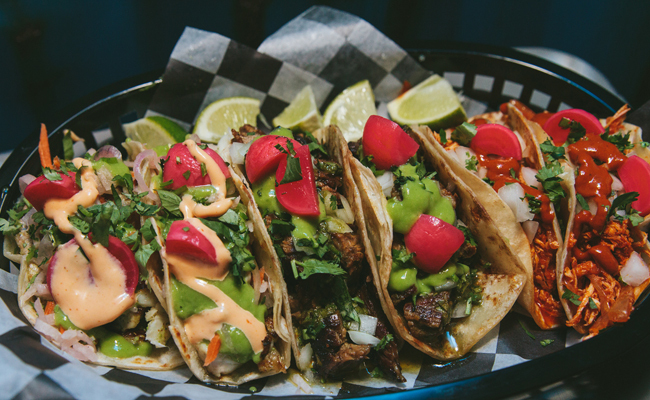 As far as tacos go, we recommend the Carne Asada (charred skirt steak, cilantro, radish, onion), Carnitas, (confit pork shoulder, cilantro, radish, onion), de Pescado (grilled fish, jicama carrot slaw, tomatillo avocado, chipotle aioli), and de Mariscos (seared squid, shrimp, pico de gallo). Ensalada ($7-$12) and three varieties of Tamales ($5) are offered in addition to various sides ($5-$9) and Con Chips ($5-$6). The relatively small drink menu provides enough options for everyone to enjoy something. Margaritas of course are available (with salt or sugar for the rim), both on the rocks or frozen for only $8 a glass or $40 a pitcher. Additional cocktails include Michelada 6, Huerta Urbana, Ensenada, and the Short Mexican Stiffy. Cocktails are priced from $8-$10. The menu also hosts wine, sangria, and a small offering of tap and bottle beer options. Opening at 5pm for dinner all week, El Rey offers a take-out window that stays open an hour after the beer garden shuts down in the early AM hours. Late night walkers, pub crawlers, and third meal snackers can stop by for food at the window until 3am on weekdays and 4am on weekends. Happy hour is held 5pm-7pm Monday through Friday. Tags: El Rey, Eric Hilton, Ian Hilton, Mexican Cuisine, U Street, Washington D.C.. Bookmark the permalink.